Pressure treated wood is lumber that has undergone a process to make it more durable and resistant to rot, termites, or fungus. 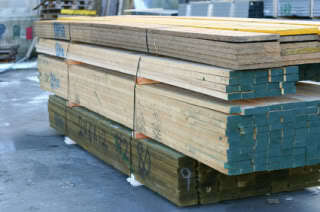 Pressure treated wood is a popular choice for outdoor carpentry projects such as decks, treehouses, garages and sheds. What is Involved in the Pressure Treating Process? The process of pressure treating wood is straightforward. After large amounts of wood are treated with chemical preservatives, the wood is placed in a huge cylindrical chamber called a retort. There is a door on one end that can be sealed airtight. Waterborne chemicals are then forced into the wood under pressure. This process forces the chemicals deep into the wood, making it resistant to termites and decay. If it's properly maintained, pressure treated wood can last for 40 years or more. Some types even have a 50-year limited warranty. Does Pressure Treated Wood Prevent Water Damage? Pressure treated wood does not prevent water damage. It only protects against rot and termites. However, some treated wood is produced with built-in water repellent, which will usually be indicated on the wood itself. Water repellent-treated wood still needs to be checked for cracking and warping and is not resistant to all moisture related damage. To help prevent moisture damage, apply a water repellent finish to the deck (or other wood structure), once a year. NADRA (the North American Deck and Railing Association) estimates that over 80% of all decks in the US are built wholly or partially with preserved wood. In addition, pressure treated wood is almost always used for posts, beams, and joists because of its structural strength and ability to withstand deterioration in ground contact. Speak to a local carpenter about using pressure treated wood for your next carpentry project.